If you have brown eyes, consider it as a blessing. Brown eyed girls are the ones that usually opt for contacts probably because they don’t know the real value of the color of their eyes. If you take a color wheel, you’ll easily find the colors that are opposite to blue and green. Pairing colors that are across each other on the wheel makes both of them more vivid. But it’s hard to determine which color is opposite of the brown one since this is a blend of many hues. Well, that’s why you should be thankful if you are a makeup junkie with brown eyes. This neutral eye color makes it easy for you to play with the widest variety of eyeshadows. Fact: there are multiple ways to make brown eyes stand out with makeup. So, let’s break this down for you. If you have bright brown eyes, almost golden, you should opt for vivid purple, lavender, violet, lilac, magenta, and royal blue eyeshadows. Since your eyes are on the warm side, these cold-toned hues will make them pop. If your brown eyes feature reddish and orange tones consider vivid colors such as turquoise, emerald, aquamarine, navy, and sky blue as your best options. For those with almost black eyes, every color will do the job. Dark brown-eyed ladies have so many options but if you want to add warmth to your look go for bronze, golden, coral, orange, red and burgundy tones. Although orange and burgundy eyeshadows may seem too vibrant at first glance, they flatter any complexion and eye color. You can always additionally accent your brown eyes with black eyeliner or eyeliner in a contrasting color that will make them stand out even more. If you prefer less-time consuming makeup looks, a hued eyeliner might become your best friend. You can skip all the blending and packing color on the eyelids with a simple line that will make your eyes pop. Brown eyes have so many hints of different colors that you can make any eyeshadow work in a flattering way. So, you should never consider brown eyes as boring. All you need is to play with colors and you’ll be thankful for your beautiful brown eyes. 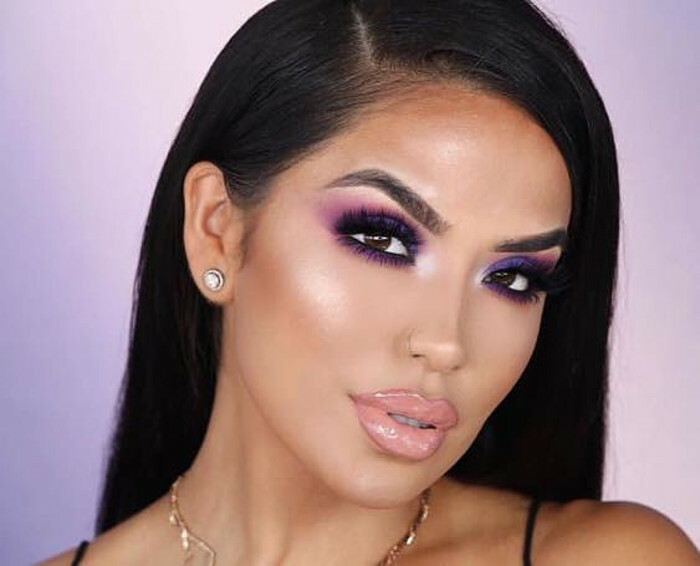 Instagram beauty influencers are the best source when it comes to innovative makeup looks. Take a look at how these beauties made their brown eyes pop with makeup. Don’t forget to hit the Pin button and save your favorite looks. Make your dark brown eyes pop with vibrant shades of purple. You can skip the eyeliner and leave the color to shine in full force.